Subscription boxes are a big thing these days, not that I mind! I've been a long-standing subscriber of the Mail More Love box for example. I love getting a surprise packages in the mail; so when the good folks at Neko Box offered to send one of their boxes for review, I gladly accepted. They send their boxes from Tokyo and the items are all Japanese crafted and designed including such favored brands like Classiky and Chamil Garden. They sell individual items as well as themed boxes and their subscription kits. The two subscription options are the Neko Box, which is more homegoods focused, and the Zakka Kit, which is more stationery and craft oriented. The Zakka Kit I got was cat-themed. I don't know if I picked the cat-theme, but boy, talk about stacking the deck in your favor. It's got CAT STUFF. It's got CAT-THEMED STATIONERY STUFF. Of course, I like this. It seems a good deal and an easy gift idea for this upcoming holiday season. Any stationery lover would enjoy one of these Zakka Kits. If you give them (or yourself) a subscription, then that's the benefit of more gifts and a bit of savings too. My only problems with the kit is that the cat print came a little crunched and that it took about three weeks to arrive. The second part is really just international mail being international mail, but it is worth keeping in mind the shipping time and cost. All-in-all, I really did like it. I thank the Neko Box people for the opportunity and hope they continue making quality gift sets. You should thank them too, because you can win this box! Leave a comment with an item on your holiday wish list that you think your letter writing compatriots might like. I'll select a random winner next Friday. Contest now closed YAY! The illustrator Edward Gorey was quite the mail artist in his time. In his honor, the Edward Gorey House hosts an annual mail art contest. The contest is now open for submissions from artists of all ages from around the world. Submit your original envelope artwork postmarked no later than October 27th, 2017. There is no entry fee though artists can only submit one entry to the contest per year. Prizes will be awarded in five different age groups. Remember to enclose the entry form. You can see previous winning entries here. Your Cat Can Be A Post Office Cat! "Following the passing of Tibs the Great, the last great Post Office cat, The Postal Museum is searching for 12 volunteer mousers to fill the vacancy until September 2018. Each month a successful cat-pplicant will be appointed to the ceremonial role of Postal Museum Cat (PMC). PMCs are expected to work from home so must be reliable purr-fessionals. While a volunteer position, there are great purrks, including provision of an official hat (modelled above by Charlie). To apply, owners must submit a photo of their cat to The Postal Museum on Facebook, Twitter or Instagram using @ThePostalMuseum and the hashtags #jobsfurcats and #catsinhats. A template hat is available to download to aid candidates with their cat-pplication. Applications for September close on 31 August 2017." Now to make the best hat and force gently place it on my cats! It's been nearly a year since the publication of Mary & Me: A Lasting Link Through Ink. The authors, to celebrate, are generously hosting a giveaway of a copy to one of our readers. Kathy and I had a unique opportunity to write the forward for the book. The book follows their thousands of letters through their thirty year friendship. It's always a distinct pleasure to see pen pals with strong and lengthy correspondences. "For thirty years, the Marys have maintained their correspondence, their connection empowered by sheets of paper. Through their letters, these two friends have been able to get through extremely difficult moments and grow as mothers, friends, and community members. Their commitment to each other is apparent within these pages. One cannot help but smile when reading how Mary Kenyon and Mary Humston have flourished through their friendship with each other." But wait, there's more. She's given a coupon code so we can all be winners: LWALOVE will give users 10% off their purchase! Thanks Sarah and good luck everyone! In celebration of National Card and Letter Writing month, the cleverboots crew over at Leafcutter Designs is holding a contest to win one of their smashing "Letters To My..." series. All you have to do is go to their blog and share your favorite letter. There's extra credit for including a picture. The contest is open til April 30th, 2016. Good luck, L.W.A. members! Announcing the 22nd Graceful Envelope Contest hosted by the Washington Calligraphers Guild and National Association of Letter Carriers. The contest is open to all ages, with separate categories for children. There is no entry fee. Winners will be chosen based on artistic hand lettering, creative interpretation of the theme and effective use of color and design, including incorporation of postage stamp(s). Check out past winners here! The envelope at the top is last year's Best in Show piece by Hannah Holder. In honor of National Handwriting Day (it was on Saturday, January 23rd), L.W.A. Ambassador Greer is doing something big! This is something all L.W.A. members will want to take part in. You can win $100 gift certificate to Greer to be used in-store or online and a Kaweco pen. There are three categories to chose from: cursive, print, and freestyle. Contestants can only enter one category. To enter, contestants will snap a photo of their handwritten quote and post it to Instagram with the hashtag #greerchicagowriteoff and either #cursive #print or #freestyle to indicate the category you're entering along with the mention @greerchicago. The contest will close at midnight, February 1. I have a really great feeling about this! Get those pens working! I'm confident L.W.A. members have what it takes to really impress here. I'd love to participate, but I'm disqualified. The nerve! All because I work there occasionally, and because Kathy is one of their honored judges. Show them what you've got! Don't you know it? It's A Christmas Carol, by Charles Dickens. In honor of the season, and in proper holiday spirit (emphasis on spirit), we have a giveaway for you! Along with our fiends friends over at Evil Supply Company, we offer to you this small gift. To claim one, please send us a picture of your favorite post office or mail box. You can email them, along with your L.W.A. member number and mailing address, but if you mail us your picture and info, you'll get an extra secret special something. Offer valid until December 31st, 2015 or til I run out of wee little notebooks. Thanks so much to the Evil Supply Co. for the opportunity. Did you know, they are an L.W.A. Ambassador! 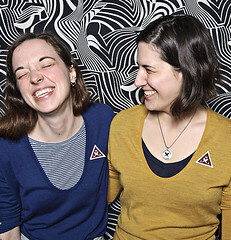 They join Shop Analog and GREER as places where you can get a membership to the Alliance. What good company! P.S. And do check out Evil Supply. Their stationery and other goodies are sheer delights. Kathy and I had a unique opportunity to write the forward for the upcoming book Mary & Me: A Lasting Link Through Ink. The book follows their thousands of letters through their thirty year friendship. It's always a distinct pleasure to see pen pals with strong and lengthy correspondences. What a treat to share in them with the Marys in this new book. Also a treat, the Marys are hosting some classes and talks to promote the book. 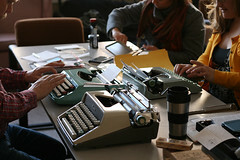 They are having "Letter-Writing 101" workshops for women at libraries and bookstores. You can find a listing of the events on their website. The first one is August 29th (TOMORROW!) at the Carroll Public Library in Iowa. We are also hosting a give-away of a copy of the book here. EDIT: 8/31/15: The contest is now closed. To win, please leave a comment with your fondest pen pal memory. A winner will be chosen at random on Monday morning, the 31st of August, 2015. Standard L.W.A. contest rules apply (AKA you'll be asked to provide your member number to claim your prize).